Born in Haddington, East Lothian, William Gillies interest in art was encouraged by his uncle, William Ryle Smith, an art teacher and watercolourist from Broughty Ferry. He enrolled at Edinburgh College of Art in 1916 but after two terms was called up to serve in the war in 1917, resuming his studies in 1919. His teachers at ECA included D M Sutherland who influenced his use of colour, David Alison who influenced his handling of oil, Adam Bruce Thimson and Donald Moodie. In 1922 Gillies graduated and became a founder member of the 1922 Group with Sir William MacTaggart, Robert Crozier, Geissler and others. In 1923 he received a Travelling Scholarship and visited Paris with Geissler, studying with Andre Lhote. Lhote’s decorative Cubism did little for Gillies and he made his way to Florence. After a year teaching at Inverness Academy, Gillies joined ECA’s staff, which now included MacTaggert with John Maxwell, joining in 1929. During the late 1920s and 1930s Gillies developed a loose, almost Expressionist style, painting the Scottish landscape on the spot, often spending painting holidays with John Maxwell and others in Dumfries & Galloway. 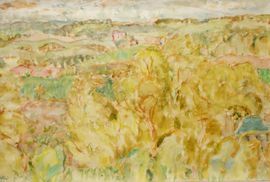 In 1939 Gillies moved to the Midlothian village of Temple where the surrounding landscape provided the subject for many of his later works. He visited the villages of East Linton, Haddington, Howgate and Gifford on his motorcycle, painting in oil and watercolour. In the post war period his landscapes became more complex, using intricate patterns of roofs, winding roads, fences, trees and hedges as constructive elements. Pencil and ink outlines became important in his watercolours. He also enjoyed the east coast fishing villages whose nets and boats provided similar fascination.